Home › Scholarly Communication › How Do You Know A Journal Is Legitimate? As a researcher or scholar under pressure to publish, you may accept solicitations to submit articles for publication even if you are not familiar with the journal or publisher. Some of these offers are legitimate but others turn out to be scams perpetrated by predatory publishers. It is wise to take a few basic steps to learn more about a new or unfamiliar scholarly journal. If you have questions, or want to discuss scholarly publishing, contact Darren Chase, Head of the Center for Scholarly Communication: darren.chase@stonybrook.edu | 631.632.9830. Great research deserves a great publisher. If open access, is it registered in the Directory of Open Access Journals (DOAJ) The DOAJ vets journals before listing them. Has it been assigned ranking(s)? E.g. Contact your liaison librarian or Darren Chase, Liaison/ Scholarly Communication Librarian. 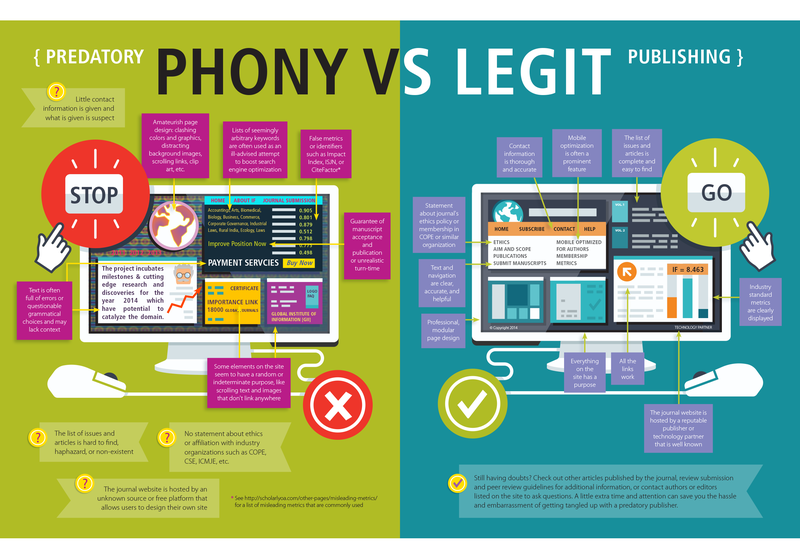 See a detailed infographic on predatory publishing. Eisen, Michael. “Door-to-door Subscription Scams: The Dark Side of The New York Times.” It Is NOT Junk. michaeleisen.org, 9 Apr. 2013. Kolata, Gina. “Scientific Articles Accepted (Personal Checks, Too).” The New York Times. The New York Times, 07 Apr. 2013.